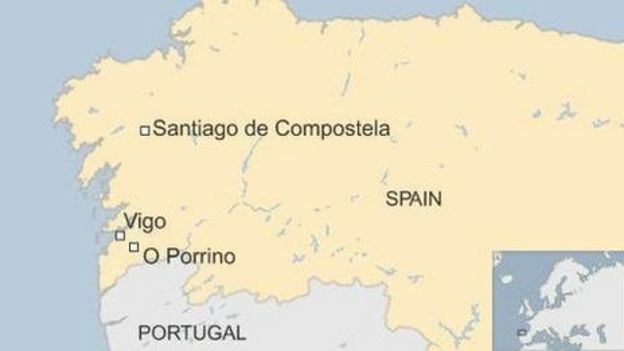 At least four people have been killed and 49 hurt in a train derailment near O Porrino in north-western Spain. About 60 passengers were on the Portuguese train when it derailed at 09:30 (07:30 GMT) near the town's station. The driver was among the dead. In Friday's crash the train apparently hit part of a bridge, El Pais newspaper reported. A photo showed that the train had also struck a signalling tower next to the line. The train operator is Comboios de Portugal and it was travelling on the Vigo-Porto route. Spanish media say only a few of the injured were severely hurt. According to El Pais, many people managed to walk off the damaged train.